yourself with Welsh Country Inns. Including Aberystwyth, Harlech, Dolgellau, South Snowdonia and more. Please scroll down the page for our selection of hotels and country inns in Mid Wales, including the university town and resort of Aberystwyth, Harlech, Dolgellau and southern Snowdonia, Knighton, Llandrindod Wells and the Welsh Marshes. Just click on the name of the hotel or inn for more details, photos, prices and book on-line! This family run inn is situated just 1.3 from the famous town of Hay-on-Wye. The extensive food menu provides delicious home cooked meals, whilst many of the en-suite guest rooms have been lovingly renovated in a contemporary style. The Red Lion Inn is a cosy 16th century Drover inn situated in the wild and ancient landscape of Mid Wales. It is the perfect base for exploring the rolling Radnorshire Hills and the glorious Elan Valley. The Penhelig Arms enjoys a superb waterside location at the mouth of the River Dyfi in the Snowdonia National Park. You can dine in the Fisherman’s Bar or the waterfront restaurant which offers crab, bass and bream fresh from the quay as well as Welsh beef and lamb. Rooms at Penhelig Arms have simple décor, bathroom and Wi-Fi. There is free parking available on site. Aberdovey Golf Course is less than a mile away, and Penhelig Rail Station is 50 metres away. A warm welcome awaits you at Buckley Arms Hotel. Nestling within the beautiful Dyfi Valley with the River Dyfi (Dovey) to the rear of the hotel we are situated on the edge of Dinas Mawddwy within the stunning Snowdonia National Park just off the A470 midway between Dolgellau and Machynlleth. Relax in our sitting room decorated in a 'Gentleman’s Club' style with leather chesterfields and low tables or maybe while away the time in our small library. We have 6 luxury bedrooms, all en-suite with bath and shower. Overlooking by the ancient fortress of Harlech Castle, the refurbished Y Branwen Hotel offers comfortable bedrooms in pleasant surroundings. In the brasserie, visitors can enjoy freshly prepared local produce, cooked to order. The menu is changed regularly and there is an excellent wine list. There is also a cosy wine bar plus lounge bar serving a wide range of keg and traditional cask ales, lagers, ciders and bottled beers. This is a non-smoking establishment. Regrettably, due to the nature of the bedrooms, we are not suitable for those with mobility difficulties. In a valley set in the heart of the Cambrian Mountains, on the upper banks of the gin-clear River Dovey, lies the Brigands inn. In the prettiest Welsh Countryside reminiscent of a bygone age, all the cares of the outside world just melt away, enabling you to relax and enjoy excellent food in the comforts of a15th Century Coaching inn. This 14th-century hotel enjoys fine views over the mountains and across the bay to the Lleyn Peninsula. The team here is committed to restoring some of the hidden features of the house. Bedrooms, some in an adjacent coach house, are individually furnished and many boast fine antique pieces. Public areas display a similar welcoming charm, including the restaurant, which serves many locally-sourced and home-grown ingredients. There is a no- smoking policy throughout the hotel. The Minffordd Hotel in Talyllyn Valley, Mid Wales is set in probably the most breathtaking scenery in Britain and is literally situated at the base of the Cader Idris with the summit being 1 1/2 miles NW of the hotel. The original parts of the building are over 400 years old, so as you would expect, the walls are very thick and there are plenty of originally features such as the original wood beams and our log fire which is a key feature during the winter months. Dolgoch Falls Hotel is unique in its position, being located at the south western corner of Wales' Snowdonia National Park just 5 miles from the beautiful West Wales coastline. Both Tywyn and Machynlleth are close by, with the picturesque village of Aberdyfi just 6 miles away. The Hotel is family run and dates back in parts to the 13th century. This tranquil location is the perfect place to relax and unwind. Unfortunately, we are unable to accept pets. The Castle Hotel offers the finest selection of food and drinks from its Bar and Restaurant together with newly refurbished accommodation makes this the perfect place for your stay in Wales. We have 6 newly refurbished modern rooms. You will find that the Bar offers all the warmth and charm of a traditional Welsh Inn. If you choose, pull up a seat outside, sit back and watch the world go by. The Restaurant serves mainly fresh local produce. Our Cardiganshire Beef is cut to order and char-grilled to your liking. Our Fish and Seafood used in our specials is caught in Cardiganshire Bay.. This recently refurbished hotel serves lunch and evening meals via its own restaurant, whilst a lounge, fully licensed bar, and sunny courtyard seating areas ensure a relaxed and invigorating stay. Set within the town centre of Aberystwyth, the Four Seasons Hotels offers en-suite accommodation. All attractions, amenities, shopping and nightlife are just a short walk away, as are the harbour, promenade and beach. Located just two minutes from the coast and just off of the main high street, Harry's is the perfect little hotel for both leisure and business visits to Aberystwyth. Featuring a hugely popular bistro and Irish themed Bar, this lively hotel is centrally located near local transport links such as the train station that is just a minute's walk away. Bedrooms at Harry's Bistro are light and spacious, offering the ideal base at an affordable price. Ceredigion Best Bar None Award 2011. Eat, enjoy a real ale, and take in the amazing views across Cardigan Bay. Watch out for the dolphins, something New Quay is famous for. You walk into our spectacularly located pub, which is both homely and contemporary, where you will be greeted by our friendly and attentive staff. The hotel offers six double rooms and a family cottage. Three of the rooms in particular have stunning sea views, and there is free wi-fi as well as limited car parking. The Ship Inn enjoys a wonderful situation overlooking the beach. Relax on the heated sea terrace with a drink and spot the dolphins. The Ship Inn is a friendly and welcoming place to stay, eat and drink; perfect for those weekend breaks away. All rooms offer amazing views of the beach which is only a stones throw from the Pub. In the heart of Wales, between Newtown and Llanbrynmair, Aleppo Merchant Inn is surrounded by beautiful Powys countryside. There is free parking, free Wi-Fi and a traditional restaurant. The spacious, refurbished bedrooms at Aleppo all have a private bathroom and some have scenic views. A generous cooked breakfast is served daily in the bright and airy dining room. The Lounge Bar serves a varied menu and homemade specials, and the 3 cosy bar areas offer beverages and snacks. Set in a 17th-century inn, Aleppo Merchant boasts original period features and traditional charm. 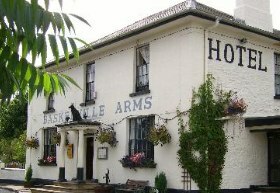 Nestled in the village of Clyro in the Welsh borders, close to the Black Mountains and the Brecon Beacons and within walking distance of the River Wye, The Baskerville Arms is just 1.3 miles from the famous town of Hay-on-Wye. As a small family run Inn we believe in the personal touch to ensure every guest gets the most from their stay. Enjoy a drink in our charismatic bar or go through to the candlelit restaurant for that romantic dinner or a meal with friends. Our extensive menu provides delicious home-cooked dishes made by our Chefs, using fresh local produce wherever possible. Many of our en-suite guest rooms have been lovingly renovated in a contemporary style. We are a Visit Wales 3-star Inn, in the middle of some of the best walking terrain in Wales; group rates on request! Originally a 14th century coaching Inn, the Horse and Jockey offers a warm and friendly atmosphere, owned by the same family since 1989. 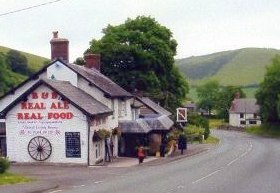 Situated in Knighton town, close to the Offa's Dyke Centre, the inn offers a cosy lounge bar with log fire and a main bar with weekend entertainment. At the end of the large courtyard is an 80 seater restaurant which offers an extensive menu. This small and friendly guest house is situated in an imposing 16th century stone-built building, ideally located in the heart of the Teme Valley in Wales on the English border. The bar offers real ales, home-cooked food and cosy open fires. The bar serves at least 2 real ales, as well as smooth bitter, draught stout, dry cider and lager. Dogs are allowed in both the bar and the rooms. The surrounding area offers fantastic opportunities for country walks on Offa’s Dyke and Glyndwr’s Way. The landlord of the inn is a keen walker and will be happy to give advice on routes. Set in wooded grounds and gardens, this relaxed country house hotel with a 2-AA-Rosette restaurant is 1 mile (1.6 km) from the university and market town of Lampeter. Falcondale Hotel has a lovely view from its conservatory, and an atmospheric log fire in winter. In summer, enjoy a glass of wine on the terrace. The hotel is 12 miles (19 km) from the picturesque harbour town of Aberaeron. Set in charming a Georgian house, within picturesque gardens, Guidfa House is located in Crossgates, just north of Llandrindod Wells. There is free Wi-Fi and free parking. Bright and spacious bedrooms are individually furnished and include a ground-floor accessible room. Delicious breakfasts are served daily, featuring fresh local produce and homemade preserves. Freshly baked bread, soups and light meals are available in the evenings, and the bar offers a range of beverages. The Red Lion Inn is a cosy 16th century Drover inn situated in the wild and ancient landscape of Mid Wales. It is the perfect base for exploring the rolling Radnorshire Hills, the glorious Elan Valley and the spectacular lakes and mountains of Mid Wales. It is in an area of breathtaking natural beauty which has inspired Welsh Poets over the centuries. The inn features 7 en-suite guestrooms, as well serving a combination of traditional and modern cookery based on local fresh produce. The Cain Valley Hotel offers not only competitively priced accommodation, but also good food freshly prepared throughout the day and served in either the restaurant or one of the two bars. This 17th Century coaching inn has been well maintained and houses a warm, cosy atmosphere. Friendly, courteous staff are always on hand to deal with your needs. A private, off street car park is available at the rear of the hotel. Situated at the heart of Britain's smallest town, between the Cambrian Mountains and the Brecon Beacons, we offer a unique opportunity to stay in the undiscovered 'Welsh Lake District'. Accommodation is provided in a family run hotel which has stood in the centre of Llanwrtyd Wells for over 130 years. Its 19th century character, complete with open log fires, has been preserved in the lounge and public bars. All of our 21 rooms have en-suite facilities with colour TV and either bath, shower, or both. Facilities include the traditional farmers' Bell Bar featuring the original servants' bells, and a comfortable Lounge Bar. The Dragon Hotel is a 17th century family run, former Coaching Inn with 20 en-suite bedrooms. Set in the quiet village-sized town of Montgomery, beneath the old ruined castle, surrounded by the stunning countryside of the historic Welsh Marches. Indoor swimming pool and sauna. Restaurant and bar. AA Rosette for fine food. Perfect countryside for walking including Offa’s Dyke. Near to Powis Castle. A genuine warm welcome to all. 25 minutes from Shrewsbury. Set amongst the Cambrian Mountains, The George Borrow Hotel offers cooked breakfasts and wonderful views. With free parking and friendly staff, the hotel is just 15 minutes’ drive from Aberystwyth. The individually designed rooms at George Borrow have private bathrooms, Wi-Fi access and tea and coffee facilities, and many have views across the Rheidol Gorge. The 17th-century inn has a traditional restaurant, serving homemade meals and full English breakfasts. There are 2 guest lounges, offering beverages and snacks by the cosy log fires. There is also a leafy garden where cream teas can be served.